The amount of basic benefit paid ranges from $127 to over $3,100 per month, depending on your level of disability and number of dependents. 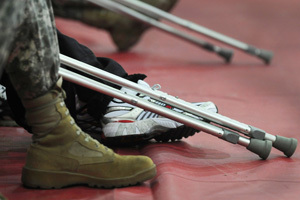 Click here to check out the current Veteran Disability Compensation rates. Mileage Rate Update: Mileage reimbursement has increased from 28 cents per mile to 41.5 cents. While increasing the payment, the current deductible amounts applied to certain mileage reimbursements will remain frozen at $7.77 for a one way trip, $15.54 for a round trip, and capped at a maximum of $46.62 per calendar month. On January 9, 2009, these deductibles will decrease to $3 for a one way trip, $6 for a round trip, with a maximum of $18 per calendar month. Deductibles can be waived if they cause a financial hardship to the veteran. The deductibles are also waived for veterans traveling for scheduled compensation or pension examinations.